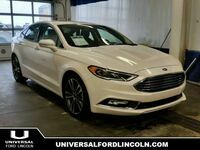 Leather Seats, Heated Seats, Bluetooth, Blind Spot Detection, Premium Audio Package! Station wagons aren't very common these days. This Ford Flex will make you wonder why. Tons of space, distinct style, and an impressive drivetrain make this wagon an appealing package. This 2016 Ford Flex is for sale today in Calgary. Style meets substance in the Ford Flex. In a world full of crossovers and uninspired sedans, this unique wagon is a true standout. Versatility is the name of the game. This Flex is an excellent family hauler with generous room for cargo and three rows of seats for passengers. On top of all of that, it's even fun to drive! Try something different and check out this Flex today! This wagon has 97996 kms. It's white platinum metallic tri-coat in colour. It has an automatic transmission and is powered by a 3.5L V6 24V GDI DOHC Twin Turbo engine. This vehicle has been upgraded with the following features: Leather Seats, Heated Seats, Bluetooth, Blind Spot Detection, Premium Audio Package, Sync, Satellite Radio. It has some remaining factory warranty for added peace of mind. Our Flex's trim level is Limited. You might think of expensive European cars when you think of a luxury wagon but think again. This Ford Flex Limited is full of luxurious features to accompany its bold look. It comes with a gorgeous interior with Yoho maple wood grain trim. All-wheel drive adds even more versatility letting you get through just about any road condition. The SYNC 3 infotainment system with Bluetooth SiriusXM satellite radio, Sony premium audio, and an audio input jack keeps everybody entertained and automatic climate control with rear auxiliary keeps everybody comfortable. Creature comforts and safety features include heated leather seats, a leather-wrapped steering wheel with audio and cruise control, push-button start, remote start, reverse sensing system, anti-lock brakes, blind spot information system with cross-traffic alert, a backup camera, and much more.